Several classical tunes here. Can you name them? This entry was posted in classical music and tagged beethoven, covers, Rossini, Vivaldi by pacificsymphony. Bookmark the permalink. The violinist upstairs is playing Beethoven’s Fifth (“Spring”) Sonata. 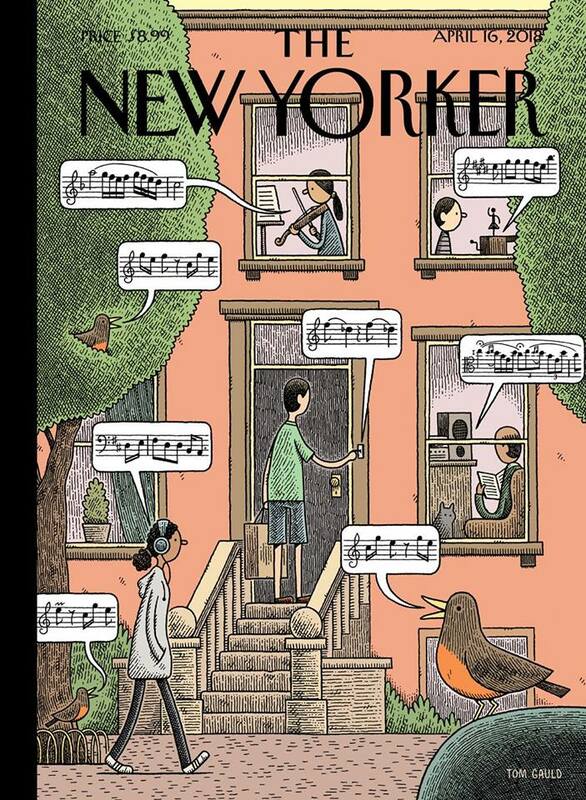 Her neighbor is listening to “Spring” from Vivaldi’s Four Seasons. Downstairs it is Stravinsky’s “Rite of Spring”. There seems to be a theme going on there! Correct! Do you know what the person wearing headphones is listening to? Cannot recall this at the moment, but i wouldn’t be surprised if it is something springy as well, though i don’t remember such tune either in Schumann’s Spring Symphony or in Copland’s Appalachian Spring. Meanwhile, the three birds are all in perfect harmony with their variations of the c-major chord.